Fixed media or hard drive storage is a very vast and diverse market. Hard drives range from high capacity server array drives to the small microdrives about the size of a quarter. With all the variety of drives out there on the market, how does one go about choosing the right drive for their computer? Finding the right drive really comes down to knowing what you want in a drive. Is performance the driving factor for the computer? Is capacity all that matters? Or is it aesthetics? These are the three primary categories for examining any hard drive on the market. Hopefully, this guide will help you determine which of these factors matter and how to look at them when purchasing your next hard drive. There are currently two primary interfaces used for hard drives for personal computers on the market: Serial ATA (SATA) and IDE (or ATA). There is also a SCSI interface that was previously used for some high-performance desktops but this has since been dropped and is typically only used for server storage. IDE interfaces are the most common form of interface found on personal computers. There are a number of speeds available for IDE ranging from ATA/33 to ATA/133. Most drives support up to the ATA/100 standard and are backward compatible with older versions. The number in the version indicates the maximum bandwidth in megabytes per second the interface can handle. Thus, an ATA/100 interface can support 100 MB/sec. Currently, no hard drive is able to reach these sustained transfer rates, so anything beyond ATA/100 is not needed. The biggest drawback to the IDE standard is how it handles multiple devices. Each IDE controller has 2 channels that in turn can support 2 devices. The controller must, however, scale its speed to the slowest device on the channel. This is why you see 2 IDE channels: one for hard drives and a second for optical drives. A hard drive and optical drive on the same channel results in the controller scaling back its performance to the optical drive speed which degrades performance for the hard drive. Serial ATA is the new interface and is rapidly replacing IDE for hard drives. The simple interface uses once cable per drive and has speed ranging from 150 MB/s up to 300 Mb/s for the latest versions. For more information on this interface, see our Serial ATA article. 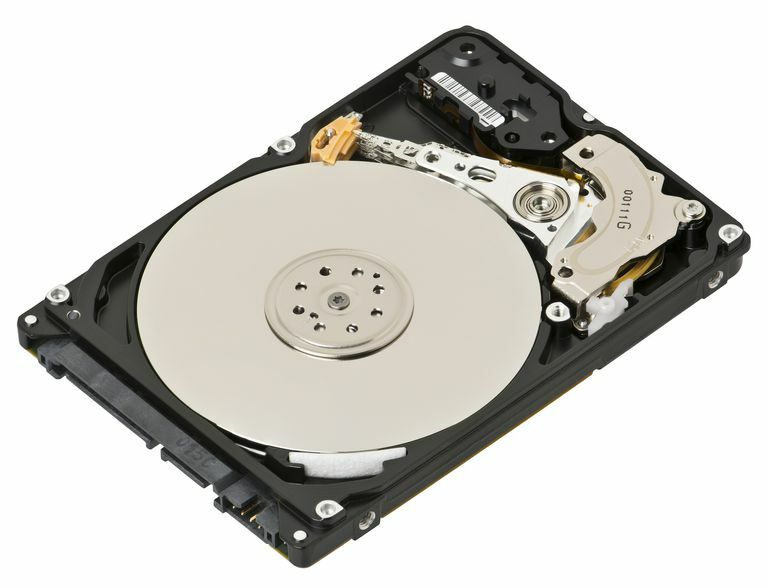 The rotational speed of the disks in the drives is the largest factor in the performance of the drive. The higher the rotational speed of the drive, the more data the drive can read and write from the drive in a fixed amount of time. Heat and noise are the two byproducts of higher rotational speed. Heat impacts the performance of the electronics within the computer, especially if there is poor ventilation. Noise can cause distractions for people in or around the computer. Most home computer hard drives rotate at 7200 rpm. Some higher speed server drives run at 10,000 rpm. All four are rated in milliseconds. Read seek is generally an average time it takes to move the head from one position on the drive to another to read data from the drive. Write seek is the average amount of time that it takes the drive to move to an empty space on the disk and begin writing the data. Track-to-track is the average amount of time the drive takes to move the drive head to each sequential track on the drive. Full stroke is the amount of time it takes the drive head to move from the outer to inner portion of the disk or the full length of the drive head's motion. For all of these, a lower number means higher performance. The final factor that impacts performance for a hard drive is the amount of buffer on the drive. A drive's buffer is an amount of RAM on the drive to store frequently accessed data from the drive. Since RAM is faster at transferring data than the drive head operation, it increases the speed of the drive. The more buffer on the drive, the more data that can be stored in the cache to decrease the amount of physical drive operation. Most drives today come with an 8MB drive buffer. Some performance drives such come with a larger 16MB buffer.